My recipe for Mini Vegetable Quiche Muffins is a perfect way to pack protein and vegetables into breakfast. Make these ahead of time for easy heat and go breakfasts all week long! A perfect simple vegetable quiche loaded with flavor and nutrients is the ideal way to start your day. This easy vegetable quiche recipe has to be one of my new favorites! 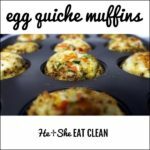 Make it once and you have 12 delicious mini quiche muffins that are not only clean but filled with goodness and only around 50-60 calories each! These are ideal for many diet plans and really pack in the nutrients and healthy protein in a small package. If eating clean real ingredients is important to you and your family, this recipe will be perfect. I focused on packing healthy protein and a variety of vegetables into each bite. 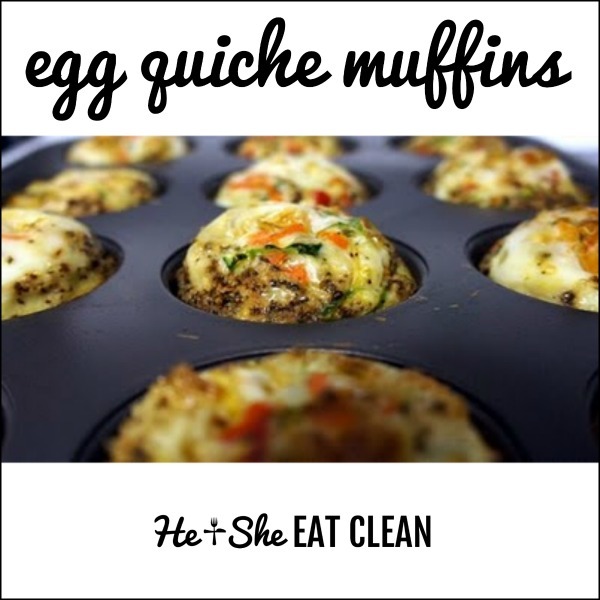 Fueling your body with nutrient dense foods like these quiche muffins keeps your body healthy. One concern many have about cooking these quiche muffins is that the vegetables will make them too soggy and they won’t set well. While this is true for many vegetables, it is not for the ones chosen. 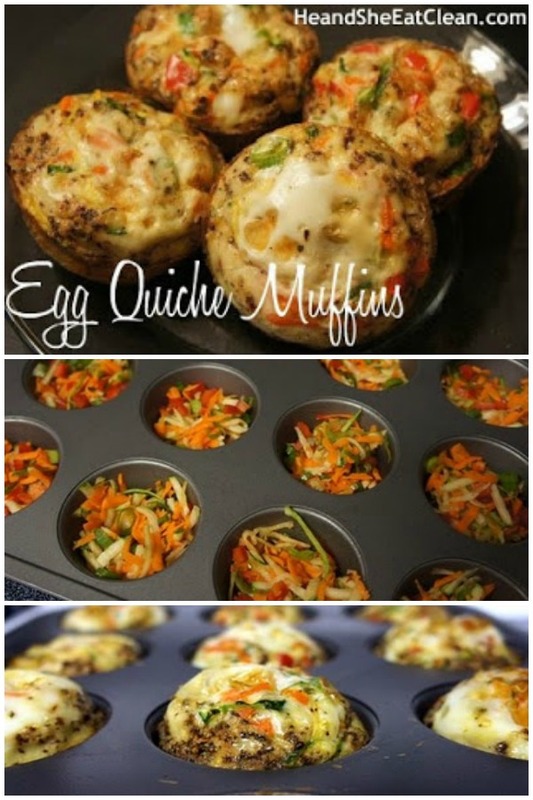 Below are some tips for how to make sure your vegetable quiche muffins turn out fantastic. Never use frozen vegetables in your quiches. As they thaw, they will release excess water and create consistency issues. Make sure to dice, shred, or chop your vegetables into small pieces so they cook evenly along with the egg. Add different vegetables for variety. Spinach, broccoli, and asparagus pair well with egg. Making these ahead of time is what makes them one of my favorite additions to our breakfast routine. The vegetable quiche recipe is super simple and so easy to make in bulk batches. It ends up being ideal for those who like to prep meals ahead for weeks at a time. Before refrigerating, allow the vegetable quiche muffins to cool completely. Storing them when still hot can create condensation in your container which leaves you with less than desirable textures. Store in an airtight container for up to 1 week in the refrigerator or up to 4 months in the freezer. If storing in the refrigerator, line your container with a cloth or paper towel to absorb any excess moisture – this helps when reheating to retain texture. If freezing, wrap them individually so it is easy to grab just a few at a time to thaw overnight before reheating. I believe heating in the toaster or oven gives the best texture and flavor. Heat at 375 degrees for 7-8 minutes works great. While you may love these vegetable quiche muffins just as much as we do, you probably want some more variety in your breakfast. That’s why I am sharing links to a few of my other favorite breakfast recipes below for you to check out. Add these to your routine to keep your taste buds happy! Make these Vegetable Quiche Muffins for an easy and healthy grab and go breakfast that your whole family will enjoy! Use a 1/3-measuring cup for the egg mixture and pour slowly into each muffin tin. The egg mixture should fill in the rest of the way. Bake for 30 minutes or until muffins have risen and are slightly browned. Serve. I put the eggs in the blender to mix thoroughly and pour into the muffin tins. No messy drips! I wanted to address the poster who said that she ruined a muffin pan. I did this too the first time. Either I used Pam or Extra Virgin Olive Oil. The past three times, I’ve used Olive Oil and they come out perfect. Also, I add spinach and spiced black beans. And then when I’m ready to eat them, I add salsa and cheese – delish! Perfect for when I’m trying to lose a few pounds. I just pulled them out of the oven and they look like heavenly clouds of delish! I put a tad of mozzarella on top too. Cannot wait to dive in! Thanks for all of these yummy recipes. I am new to all of this clean eating but I am having such fun exploring. I made these this morning but just put green pepper, spinach, and mushrooms! I filled the tins about half ways With the veggies and bought 100% egg whites being the only ingredient and poured egg whites to the top of the tin! Since I used all egg whites I ate 2 and paired it with 1/2 c of clean oatmeal! To help all the readers with the egg whites carton vs. whole eggs it is more expensive but it beats throwing away egg yolks! Thanks again! I just love these! I add mushrooms and fresh spinach to them and they are delicious. Thanks for posting easy and clean recipes! just recently found your recipes and decided to give them a try. I typically eat clean but my husband resists changing his diet. I didn’t tell him it was clean eating and made the turkey muffins, mashed cauliflower and the quiche for the next morning. He loved it! All of it and took more to work today to eat! Thank you so much for the delicious, healthy, and filling recipes! I’m making more tonight! Just made these and they were AWESOME! I will definitely be perusing your other recipes! I have also varied the veggies, it’s my new favorite! I have frozen them, they are a little watery reheated but still good.